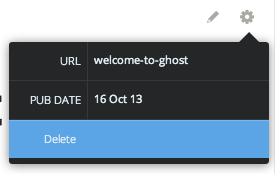 Ghost is an exciting new blogging platform that can be used to easily manage your posts, update themes, and edit content. A simple, yet powerful interface allows you to get to work immediately and publish beautiful results. 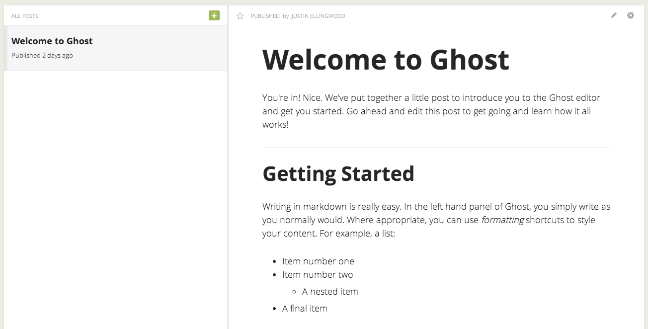 In this guide, we will discuss how to use Ghost to create and manage your content. In the second half of the article, we will discuss how to change themes and adjust basic settings. We assume that you have used the DigitalOcean Ghost one-click application to deploy your server. We also assume that you have completed the basic Ghost configuration outlined in this guide. You should be able to access your blog by going to your domain name. You will see the pre-configured sample post called "Welcome to Ghost". Currently, it is the only post that we have on our blog. As we add content, each new post will get a tab on the left-hand side. If we select any of these posts, a preview will be displayed on the right side. This represents how the content will be displayed on our site. In the preview pane, we can see two buttons useful for editing. If you click it, you can adjust the URL snippet that will be used to refer to the post. By default, this will be an adjusted string made from the post title. You will be taken to a screen where you can edit on the left side and see the results on the right side. 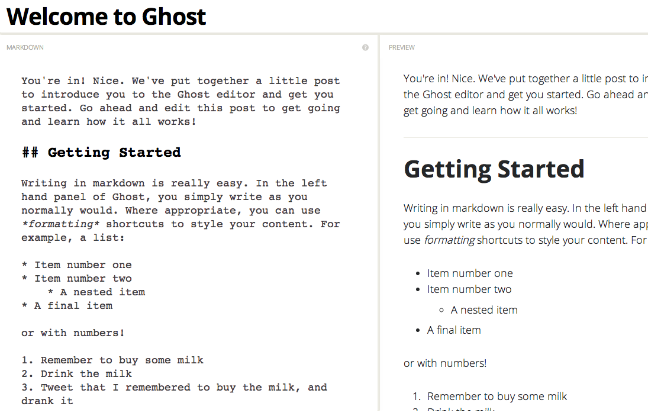 Ghost uses markdown, a simple markup language, to create post content. 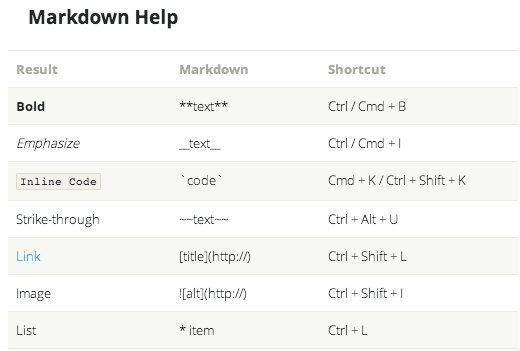 If you need some help with markdown syntax, you can either visit the markdown site linked to above, or click on the in-site shortcut button that ghost provides. A reference sheet will pop up with the appropriate way to style different elements in your page. You may notice that you also have a gear icon in this interface. It provides a consistent menu that mirrors the gears in the other screen. 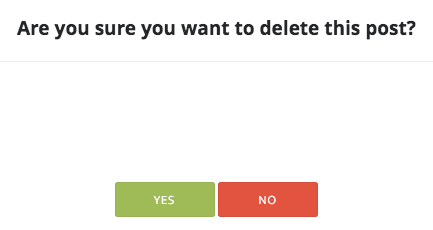 The button will change to a red "unpublish" button. Click the button to confirm. 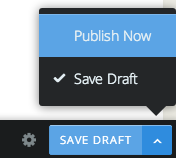 You will be taken to the editor screen, just like when you edit a post. This time, all fields will be blank. Choose a title and begin writing your post in the left-hand side. 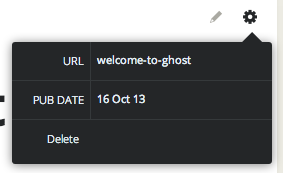 You should now have a good idea how to navigate the content management pages of Ghost. 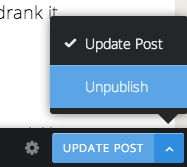 You can create posts, update posts, and delete content easily. In the next section, we will demonstrate how to adjust your Ghost theme and settings.